Spontaneous movement of solvent particles from a dilute solution or from a pure solvent towards the concentrated solution through a semipermeable membrane is known as osmosis (Greek word : 'Osmos' = to push). (c) can be stopped if some definite extra pressure is applied on the solution risen to height (h). This pressure that just stops the flow of solvent is called osmotic pressure of the solution. This pressure (p) has been found to depend on the concentration of the solution. Osmosis is a process of prime importance in living organisms. The salt concentration in blood plasma due to different species is equivalent to 0.9% of aqueous sodium chloride. If blood cells are placed in pure water, water molecules rapidly move into the cell. The movement of water molecules into the cell dilutes the salt content. As a result of this transfer of water molecules the blood cells swell and burst. Hence, care is always taken to ensure that solutions that flow into the blood stream have the same osmotic pressure as that of the blood. Sodium ion (Na+) and potassium ions (K+), are responsible for maintaining proper osmotic pressure balance inside and outside of the cells of organism. Osmosis is also critically involved in the functioning of kidneys. It is the minimum external pressure which must be applied on solution side in order to prevent osmosis if separated by a solvent through a semi permeable membrane. A solution having lower or higher osmotic pressure than the other is said to be hypotonic or hypertonic respectively in respect to other solution. Two solutions of different substances having same osmotic pressure at same temperature are said to be isotonic to each other. They are known as isotonic solutions. Vant Hoff noted the striking resemblance between the behaviour of dilute solutions and gases. He concluded that, a substance in solution behaves exactly like gas and the osmotic pressure of a dilute solution is equal to the pressure which the solute would exert if it is a gas at the same temperature occupying the same volume as the solution. Thus it is proposed that solutions also obey laws similar to gas laws. The osmotic pressure (Pi) of the solution at temperature is directly propositional to the concentration (C) of the solution. At constant concentration the osmotic pressure(Pi) is directly proportional to the temperature (T). Pi dirc.Prop.to T at constnt C.
The osmotic pressure is a colligative property as it depends, on the number of solute molecules and not on their identity. Solution of known concentration is prepared by dissolving a known weight (W2) of solute, in a known volume (V dm3) of the solvent and its osmotic pressure is measured at room temperature(T). Thus M2, molecular weight of the solute can be calculated by measuring osmotic pressure value. (c) with two side tubes. The outer tube (b) is made of gun metal which contains the solution. The solvent is taken in the inner tube. As a result of osmosis, there is fall of level in the capillary indicator (d) attached to the inner tube. The external pressure is applied by means of a piston (e) attached to the outer tube so that the level in the capillary indicator remains stationary at (d). This pressure is equal to the osmotic pressure (p) and the solvent flow from inner to outer tube is also stopped. The osmotic pressure is recorded directly and the method is quick. 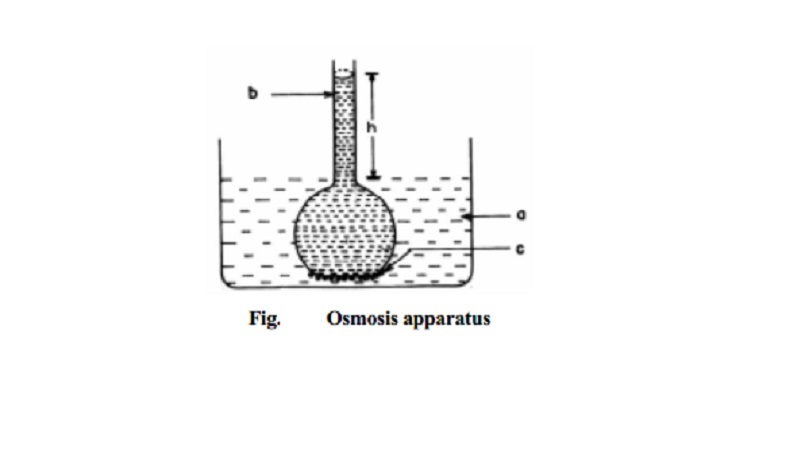 There is no change in the concentration of the solution during the measurement of osmotic pressure. The osmotic pressure is balanced by the external pressure and there is minimum strain on the semipermeable membrane.